Oh, Oscar! Up to his mischief again. 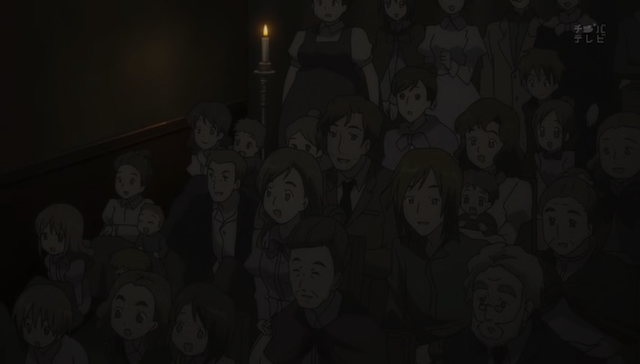 In episode 10 of Ikoku Meiro no Croisée (Crossings in a foreign labyrinth), specters haunt the Galerie du Roy. 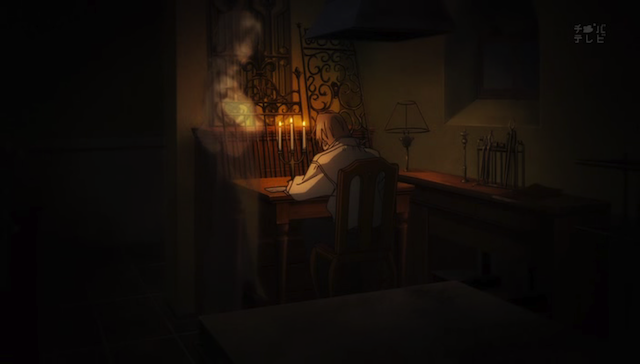 Oscar uses a strange machine to produce mysterious images of things that aren’t there, and Claude Claudel is haunted by the memory of his father, Jean. 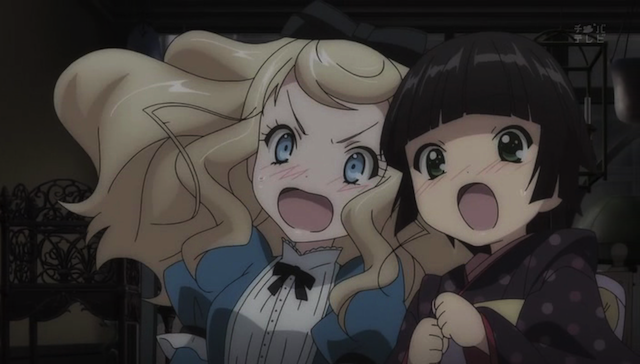 Obligatory screen cap of Alice & Yune cuteness. 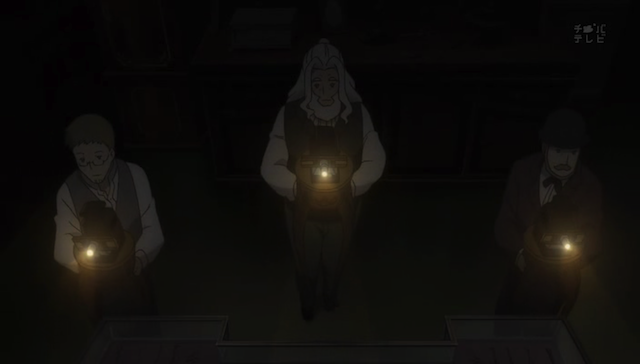 Back in Enseignes du Roy, Oscar shows off his slide lantern to Yune and Alice, scaring them silly. When Alain comes over, they get the idea to share the slide show with everybody in the Galerie. Things get crowded, and Alice gives up her seat for an old woman. Three slide lanterns are used to project multiple images. Not visible here, Alice's butler plays a snare drum, which adds considerable tension. The mechanics of presenting the slide show (called a phantasmagoria in those days) was pretty interesting, but there were a couple of other substantive points. First, Alice is becoming more and more a part of the Galerie, which is a healthy development, since she owns it, and she didn’t want it when the show started. If she comes to love the place, Claude and the other craft shop owners have a much better chance of surviving. In fact, previously, Alice was considered the enemy of the Galerie shop owners, which is an unhealthy relationship for them to have with the Galerie owner. 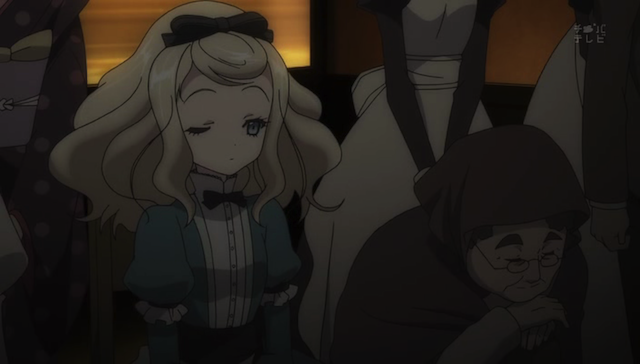 It is also a good thing for Alice in that she is having the sorts of adventures in the world that were denied Camille (in this episode she mixes with the crowd, shows that she is overcoming her selfishness, and sits among the commoners to enjoy the show). Another thing the mechanically produced phantasms provide is an interesting comment from Oscar about how these things that aren’t there, but look real can be explained. Oscar says that it may be because the viewer wishes them to be there, that gives them so much much presence. 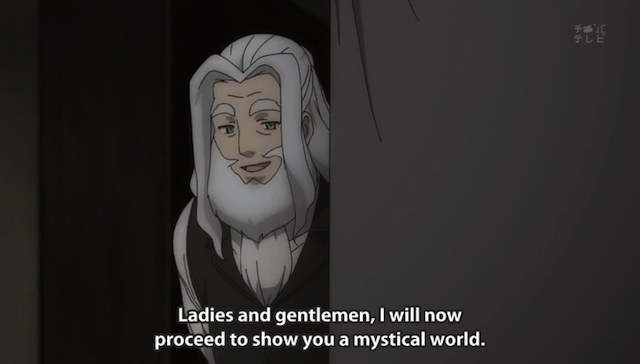 This remark is relevant to the second plot concerning Claude. 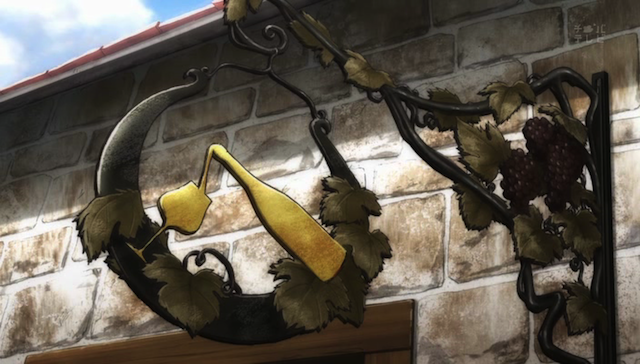 The spirit of Jean watches Claude's hard work. Claude has an allegorically related problem. People (himself included) remember his deceased father, who was very talented. Claude is effectively competing with his father in the eyes of some of his customers, who remember the incredible ironwork signs that Jean was capable of making. Claude himself remembers his father as an incredibly gifted artist, but a stern man, who seemingly never said a kind word to Claude while he was alive. Jean's old drawings show not only incredible skill with blacksmithing, but imagination, a refined, graceful taste, and an eye for detail. A sign made by Jean. It is both a source of pride for Claude that his family made it, and a challenge -- can his skills produce anything comparable? He is hidden in the shadow of his father, rather than being prized for his own talents as an artist. He has lingering issues about his own relationship with his father. Picking up on that third point, Jean was very busy with his work, but seemed to dismiss the young Claude, in the flashbacks we have seen, instead of giving detailed instruction in the finer points of the craft. Perhaps Jean died before he was able to give the instruction he had planned to give all along, but it puts Claude in an awkward spot. 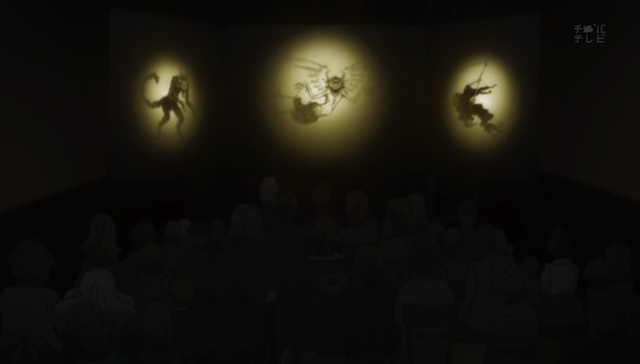 On the other hand, given Oscar’s comment, the presence of Jean’s specter, for Claude at least, must be explained by Claude’s desire for it to be there. Despite Claude’s words that his father is gone, so it doesn’t matter, he seems to want to show his father that he is doing a good job. Jean Claudel. 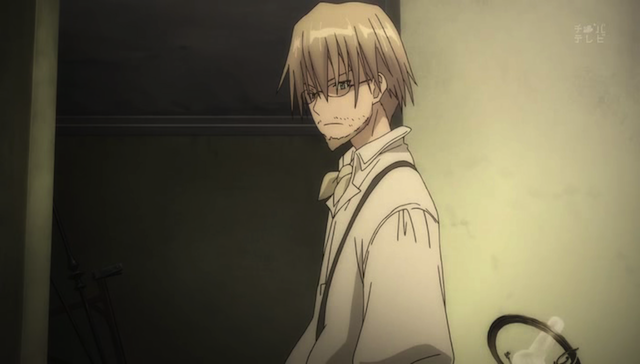 After seeing the way he treated his son, it isn't much of a wonder as to why Claude frequently acts aloof and rude. 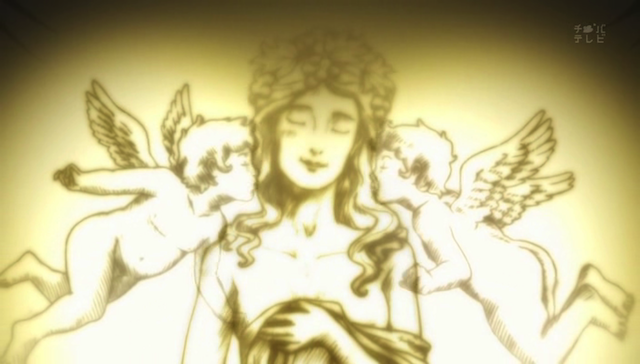 I really enjoyed this episode. 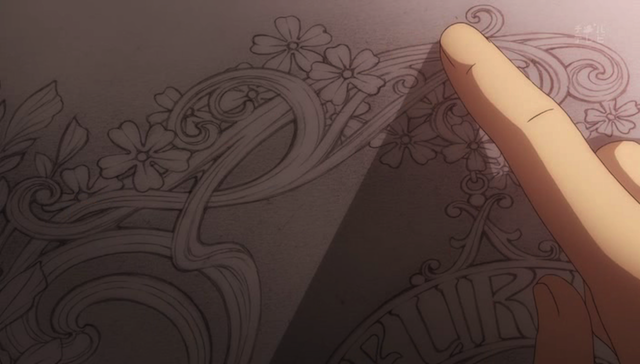 It has some serious things to think about, in terms of the challenges Claude faces, it had a very positive aspect with Alice’s development, and it had a lot of interesting depictions of design work, iron smithing, and even the public performance of the phantasmagoria (which really helped me to understand what they would have been like). And, of course, there was plenty of cuteness and eye candy. Another great episode, in a great series.